Episode four makes Bigby's struggle more personal, then ends abruptly, transferring the pressure to deliver onto the finale. 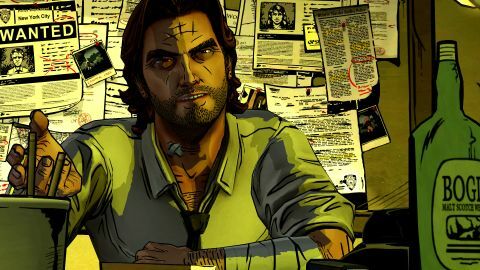 We're careful to avoid details, but this review contains minor spoilers for The Wolf Among Us episode four and the episodes preceding it. If you love to be surprised, play before reading. The Wolf Among Us ' penultimate episode is the tenderest, loneliest, and most gruesome so far. It moves fast, opening with gory button-mashing (not for the squeamish), then sprinting through the judgment of Fabletown's downtrodden before getting to the heart of the series' big bad problem. It only pauses briefly to light a Huff n' Puff, and closes without resolution or cliffhanger, but with another drag of poison before everything that's been set in motion collides. It's more like the first half of a TV two-parter than a standalone episode, but the shrinking wait time between episodes excuses that—if the feast is on its way soon, I'm happy to set the table. Dubbed "In Sheep's Clothing," episode four isn't TWAU's best— episode three 's excellent investigation sequence is still the highlight for me—but it pushes the challenge to define Bigby's values in a more interesting personal direction. In the last episode, he wrestled with justice and due process. In this episode, both feel unreachable and unreasonable. Telltale's decision-driven storytelling now asks Bigby to salvage broken lives or sacrifice their happiness for the greater good, to save Fabletown without becoming the villain—if that's even possible now—and without losing the respect of the person he cares about most. Snow White, Bigby's colleague and closest friend, is running the show, and her judgment hangs over every decision. Everyone else who calls Bigby a friend wants something from him—a second chance, a clean slate—while Snow wants order, the rules enforced as written in return for Fabletown's continued safety. She's a powerful leader, but as much as I wanted to respect her authority and foster Bigby's friendship with her, I couldn't agree with her. I chose compassion (and a bit of necessary violence) at the risk of pushing away the only person who may really care if Bigby lives or dies. In typical two-parter fashion, none of this is resolved just yet, and the intentionally abrupt ending doesn't quite hit the note of tension I think it was going for. I love that this epsiode gives Bigby a chance to give compassion a try, though, and setting that against Snow's wishes is devious. If you aren't already invested in the series, The Wolf Among Us is worth playing right now—with two caveats. Firstly, I'm concerned that the finale may hold its punches. TWAU is a canon prequel to the Fables comic series, so some things just can't happen and some characters just can't die. I hope Telltale finds a way to make us suffer for our decisions in proper noir fashion anyway. "Forget it Bigby, it's Fabletown." The second caveat is that, by nature, Telltale's episodic games lose a lot of value after one playthrough. I don't have any desire to replay previous episodes, because I'd rather maintain the illusion of choice than pick apart exactly which decisions did and didn't matter. And while Fabletown is a great setting, it's just a setting, not a place to exist in or explore. This episode is especially light on environmental interaction: there's some poking around at inconsequential evidence, a standard quick-time event fight, and two scenes in which walking down a set path builds tension without giving away more freedom than is necessary to drive the story. I'm a little sad that I can't experience Fabletown outside of TWAU's script, but there's a trade-off here: the other result of Telltale's precise direction is that each scene and frame is hand-crafted with clearly loving attention. In Sheep's Clothing bounds between locations with great set design, staging, lighting, animating, and acting: Bigby's apartment is pink with neon pollution, while his office burns yellow with chilly blue shadows. Snow is an expert at expressing disappointment, while Bigby is equal parts concerned, conflicted, and enraged. With each episode, Telltale gets better at giving volume to flatness, life to lines, and meaning to every composition. There are engine limitations and hiccups, to be sure: Light and dark don't often meet with the grace of an inker's stroke, a gentle hand clips through the arm it's comforting, and one particular scene in this episode painfully struggles with a distortion effect, briefly outlining two characters with hideous marching ants. These disappointments wouldn't be so apparent if they were incidental—the result of jamming the camera into a corner, for instance—but any flaw in an otherwise pristine, carefully directed scene is hard to miss. Don't stare too long, though: the dialogue timer is running down. A few jagged edges might leave some scratches, but The Wolf Among Us only breaks skin when it wants to. So far, it's been light cuts: pleas for help I have to deny, friends I have to disappoint, characters I never got to know better. We're still waiting for the big consequences of many of our decisions, and now the knife is in place. I hope Telltale plans to strike hard.